Assistant coach Brian Zavala, who orchestrated one of the best defenses in recent area history this past season at Montebello, has left the Oilers and will become the next defensive coordinator and strength/conditioning coach at Colony. Zavala was formerly the head coach at Wilson and later joined head coach Pete Gonzalez’s staff at Montebello where the Oilers experienced a strong showing in recent years. Zavala’s defense allowed just 9.4 points per game last season. Not sure when you’ll ever see a Montebello team do that. A Conqueror insider, so take this how ever hard you want to take it, but the next Los Altos is likely to be someone with St. Paul ties. That could anybody, I know. But that’s what we’re down to on the rumor mill. That’s the term used when Chargers top college football recruit hands off his star status on the way out the door to the next big-time prospect. This year, that process will take place between Brian Casteel, who yesterday signed with Arizona and Jermaine Braddock, the gem of next year’s class. As if you hadn’t enough of all the recruiting hoopla with Signing Day having come and gone on Wednesday, it’s now time to look forward to next season and think about the Class of 2018. Braddock figures to be one of the biggest targets in the area for college football teams. 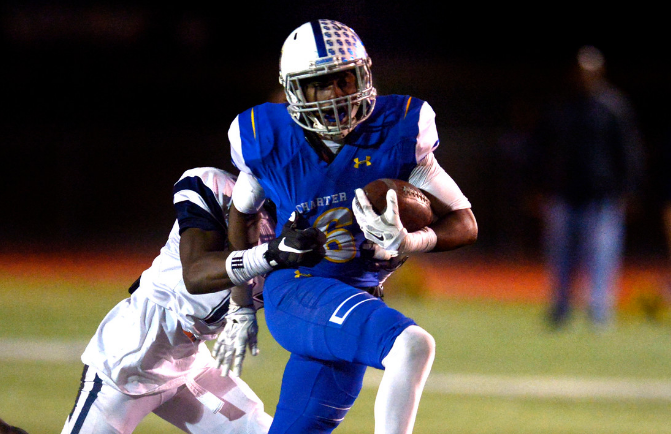 The 6-foot-2, 180-pound receiver led Charter Oak in receiving in 2016 with 1,142 yards and 12 touchdowns. Farrar also said he expects some recruiting action for tight end Louis Farrar, defensive back Michael Anywanu, offensive lineman Nate Aceves and defensive lineman Mario Mora. Just up the road at Glendora, the Tartans have a pair of offensive lineman who should garner plenty of interest. Guard Victor Arteaga stands 6-foot-3 and weighs 290 pounds and is coming off an All-Area season. Tackle Michael Chase is 6-4, 260. Lewallen also expects that quarterback Bryce Wooldridge will see plenty of Division 2 interest, if not bigger. In terms of quarterbacks, Northview’s Steven Comstock looks set to be the area’s most-prized recruit. Coming off a strong junior season in which Comstock showed he’s dangerous with both his arm and legs, the senior-to-be figures to get plenty of attention this spring. He’s already got an offer from Oregon St. The area’s overall biggest recruit, not just in terms of size but also rankings, is Bishop Amat defensive tackle Aaron Maldonado. The 6-foot-4, 300-pound may have his pick of the litter at this time next year. Maldonado is the Mission League’s Defensive MVP and already has an offer from BYU. The college football recruiting factory that is La Mirada should also put out another solid group. Former head coach Mike Moschetti reports that offensive lineman Tyler Casados already has an offer from Colorado. Moschetti also expects plenty of attention to be thrown lineman Sebastian Hernandez’s way, as well as tight end Jared Mead. And beyond next year, La Mirada has a serious Class of 2019 prospect in quarterback Josh Calvin, who is already 6-4, 200. Linebacker Cam’Ron Chapman also figures to get plenty of looks.